Staffordshire (abbreviated Staffs) is a county in the West Midlands region of England. The county town is Stafford. Part of the National Forest lies within its borders. It adjoins the counties of Cheshire, Derbyshire, Leicestershire, Warwickshire, West Midlands, Worcestershire and Shropshire. 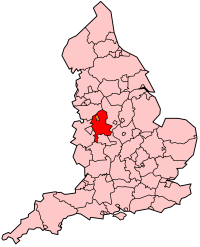 The largest city in ceremonial Staffordshire is Stoke-on-Trent. This page was last changed on 23 September 2013, at 17:30.